redeem a FREE FIRE ENGINE (worth $320). Purchase min. $400 on participating Friso products (excluding Frisolac 1 and Frisolac Comfort). A maximum of 3 receipts can be consolidated together for each redemption of Friso Fire Engine. Redemption period starts between 19 November 2018 and 31 January 2019. See terms and conditions on how to redeem fire truck. 1. This redemption program is open to all residents of Singapore except employees and immediate families (spouses, and parents, siblings, children and each of their spouses and household members) of FrieslandCampina (Singapore) Pte Ltd, its associated agencies, involved distributors and trade retailers. 2. To make a redemption, participants are required to complete an online redemption form together with uploaded images/scans of the relevant receipts and invoices (www.frisofireenginegiveaway.com). Details for accessing the website landing page for the online redemption form are available via both online and offline (SMS) means. You should refer to the promotional materials for the latest information. 3. This redemption program may be combined with and is valid in conjunction with all other valid ongoing FrieslandCampina (Singapore) Pte Ltd promotions subject to the respective promotion terms and conditions. 4. Only legitimate receipts and invoices dated from 1st September 2018, 0000 hours – 31st October 2018, 2359 hours (Singapore Time) will be accepted for this promotion. Entries submitted may be subject to verification. Any receipts/ invoices dated before or after the promotion period will strictly not be accepted for this promotion. Illegible, defaced, altered, duplicated, tampered with, inaccurate, or incomplete entries or forms without valid receipts, entries containing printing typographical, mechanical or other errors or the printing is unclear or does not contain information that is required and/or sufficient spend will not be valid for this redemption. Late entries will not be accepted. FrieslandCampina (Singapore) Pte Ltd's decision on the eligibility of each redemption and all other matters relating to this promotion shall be final, conclusive and binding. 5. Following internal verification of your submission, successful participants will receive an SMS to the mobile telephone number specified in your redemption form within 2 weeks of submission. The SMS will contain information regarding the redemption process. Redemptions must be collected at The Redemption Centre, 465 Crawford Lane, #01-28 Singapore 190465 within 2 weeks of receipt of the SMS, and during the redemption period which will run between 19 November 2018 and 31 January 2019. You may call, SMS or WhatsApp the Redemption Centre at their hotline (+65)90292024 if you have any questions. 6. Redemptions are on a first come first served and while stocks last basis. 7. Redemptions are limited to maximum TWO (2) redemptions of Friso Fire Engine per person. You may be required to provide proof of identity and residency for each redemption. This gift is fixed for this promotion and not exchangeable for cash or other items. Gift(s) not redeemed by the stipulated collection period will be forfeited. 8. A maximum of 3 receipts can be consolidated together for each redemption of Friso Fire Engine. The receipts must be original and issued by the following Participating retailers: FairPrice, Cold Storage, Giant, Guardian, Watsons, Sheng Siong, RedMart, Friso Online (www.shop.friso.com.sg), Qoo10, and Friso Official Store on Lazada (http://www.lazada.sg/friso-official-store/) during the qualifying promotion period. 9. 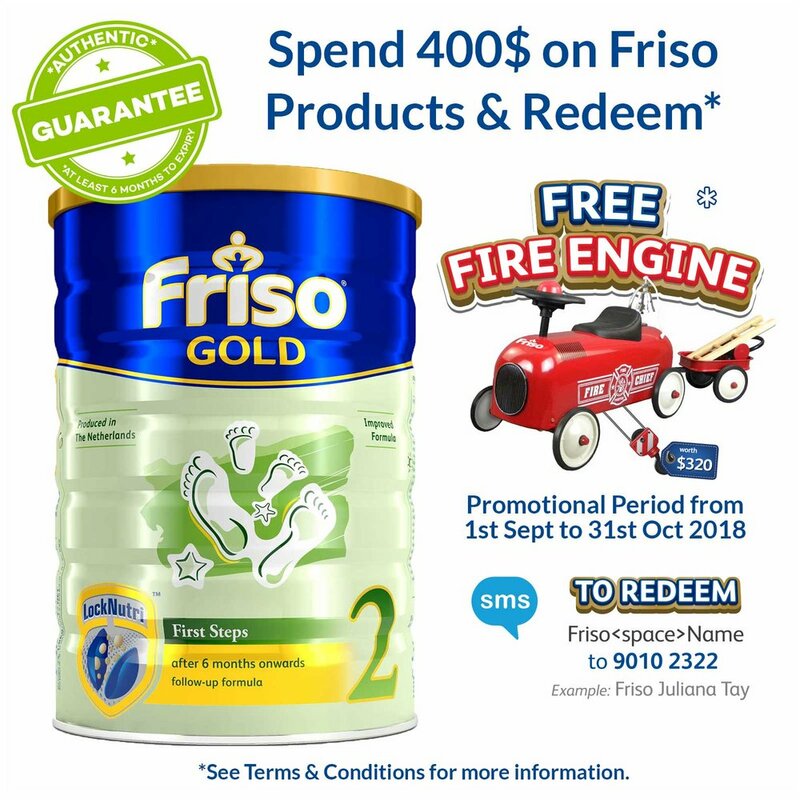 Friso Participating products include Friso Gold Stage 2 (900g); Stage 3 & 4 (900g / 1.8kg), Friso Gold Rice/Wheat Cereals (300g), Frisomum Gold (900g), Friso Gold 3 Sachet Box (330g) and Friso Gold 4 Sachet Box (450g). Friso Participating products exclude all infant formula for 0 - 6 months including Frisolac Gold 1 and Frisolac Gold Comfort. 10. FrieslandCampina (Singapore) Pte Ltd may at its discretion, at any time replace or substitute the gifts with any other of equal value, and reserves the right to vary, delete or add to any of these terms & conditions from time to time or terminate this promotion without prior notice. 12. FrieslandCampina (Singapore) Pte Ltd shall not be responsible for any problems, error or delay in the conduct of the promotion caused by or arising from breakdown, disruption, technical malfunction of any computer systems, equipment, hardware, software, servers or providers, website, telecommunication service or a combination thereof, including injury or damage to any participants or to any other person's computer or mobile phone related to and/or resulting from participating or downloading materials in or in connection with this promotion. The Friso Fire Engine will be given as-is to you without warranties of any kind whatsoever, express or implied. They should be used in accordance with the instructions manual (if provided). 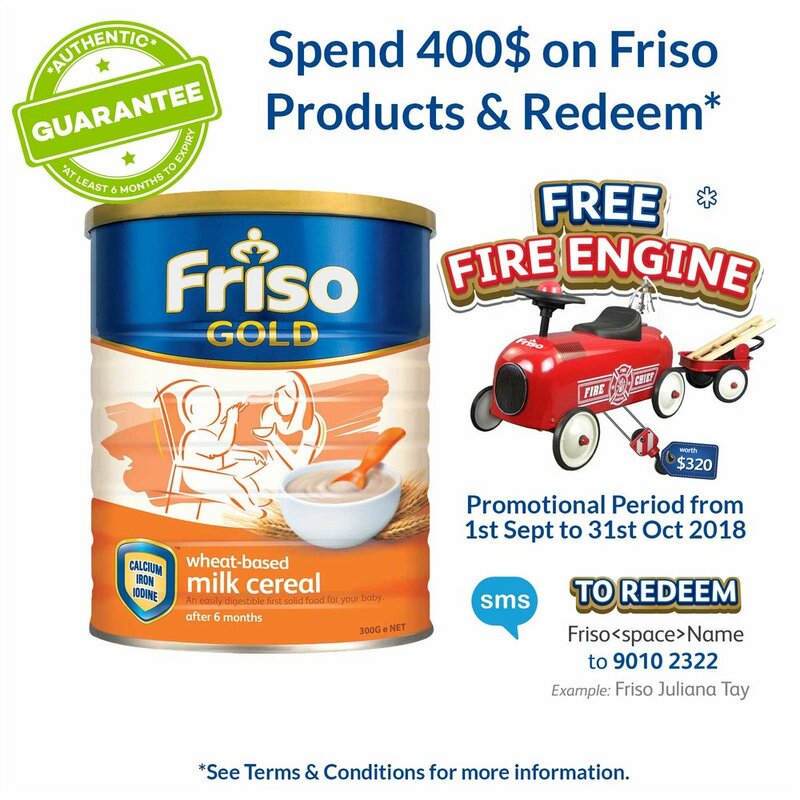 FrieslandCampina (Singapore) Pte Ltd assumes no responsibility for any death, personal injuries, and any other direct, indirect or consequential loss, damage, or costs incurred arising out of / in relation to any usage of the Friso Fire Engine, to the fullest extent permissible by law. To the fullest extent permitted by law, you and your parents/legal guardians/ children/ family members agree to release and agree to hold harmless FrieslandCampina (Singapore) Pte Ltd from and against any and all rights, demands, claims, causes of action, losses, damages, costs and expenses whatsoever , or which may arise, whether in whole or in part, and whether directly or indirectly, including agreeing that none of you will sue or make any claim against FrieslandCampina (Singapore) Pte Ltd for death, personal injuries, and any other losses or damage whether direct, indirect or consequential, arising out of the acceptance, possession and usage of the Friso Fire Engine. 14. 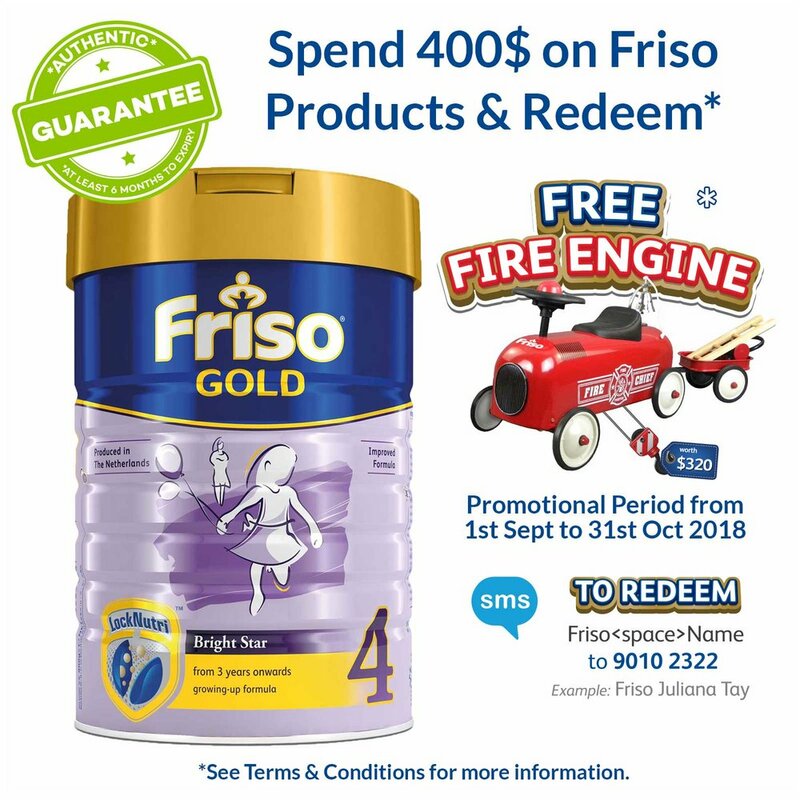 For all enquiries regarding this promotion, kindly contact our Friso Care Line at 6419 8484 (Monday to Friday 9am to 5pm, excludes public holidays). All calls to this number may be subject to charges by your telephone service provider. 15. This promotion and the terms and conditions shall be governed by the laws of Singapore. The parties hereby submit to the exclusive jurisdiction of the courts in Singapore. For all enquiries regarding this promotion, kindly contact our Friso Care Line via contactus@friso.com.sg or at 6419 8484 (Monday to Friday 9am to 5pm, excludes public holidays). All calls to this number may be subject to charges by your telephone service provider.